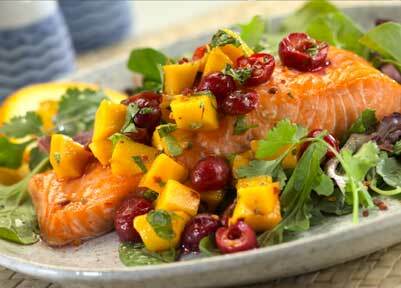 Here's our King Salmon recipes -- enjoy!! King salmon, like many fishes, can be enjoyed in numerous ways. Resembling trout in some ways, the meat has its own characteristics and distinctive flavor accentuated by a pink tinge. The salmon you buy from the store in a (yecch!) can holds nothing to a freshly caught and cleaned fish. Here are a couple of preparation techniques that will leave you gasping for air and asking for more. Peel the oranges and remove all the pith (that white, gummy stuff) you can. Slice across into quarter inch round slices. With the salt, season the salmon to your liking. Place salmon in the broiler about 5 inches from the heat source. For each inch of thickness, cook 10 minutes. (Example: A fillet 2 inches thick at the thickest point, would cook for 20 minutes). Remove salmon from broiler just prior to being cooked all the way through. Sprinkle the vinegar on top of the salmon and arrange the orange slices on the top of the fillets. Now dust the salmon with the onions and cracked peppercorns. Place in broiler for an additional 1 minute. This recipe makes four (4) servings. Simply adjust the ingredients for more fillets. Slice an onion and separate into pieces. Lay half of these slices along the foil for the length of the salmon fillet. Now place the salmon on top of the onion slices and add salt & pepper to taste. Spread softened butter on the salmon. A light layer, not too heavy. Use your hand to sprinkle brown sugar over the salmon fillet. Coverage should be medium. Take the leftover onions and cover the fillets with them evenly. Cover the salmon with two additional sheets of heavy duty foil and pinch the sides so they stay shut. Put on a hot charcoal grill for about ten (10) minutes. (NOTE: It is important that you do NOT overcook the fillets). Salmon fillets will change colors and be flaky when it is done. This makes four (4) servings, but you can make more with some adjustments. Both if these recipes can be done at the campfire or in the kitchen. In the first one above, you can improvise a broiler by using a fire rack. This raises your fire about 6 inches off the ground, so you can place the fish under the fire and VOILA!--you are broiling! Just be sure you cover the fish to avoid the ash dropping down from above. Other than that, this is a great way to cook with an open fire. We hope you have read our King Salmon recipes and decided to give them a try. If you have other King Salmon recipes you'd like to share, be sure to let us know and we may just publish them for you. Thanks, again! !